MPD Chief Lanier appeared on the Kojo Nnamdi Show this afternoon to talk about police issues with Kojo and analyst Tom Sherwood. Chief among them was the investigation surrounding the death of Ali Ahmed Muhammad near the DC9 nightclub. The Chief gave out no new information, despite repeated proddings, but said that she did stray from charging documents and published witness statements in her remarks the morning after the shooting beating. Chief Lanier also stated that they are still awaiting the Medical Examiner’s report in the case, but gave no timeline for the release of the information, beyond the fact that they’re still waiting for full toxicology reports. 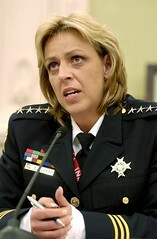 The rest of the hour covered labor issues lightly (Chief Lanier would love to give officers a raise, but is not authorized to participate in labor issues, and with the unfair labor practices complaint filed, hands are doubly tied), as well as rehashed what we already knew about the shooting of Parrot in Adams Morgan (officers are recertified twice annually in firearms safety, including a segment on animals, investigation is still ongoing). end of first graph, don’t you mean beating? There was no shooting. it takes weeks to determine cause of death? It can take weeks to determine cause of death because that’s how long it takes to run lab tests, depending on how backed up the lab is. The ME only gets the results back quickly on TV cop shows.